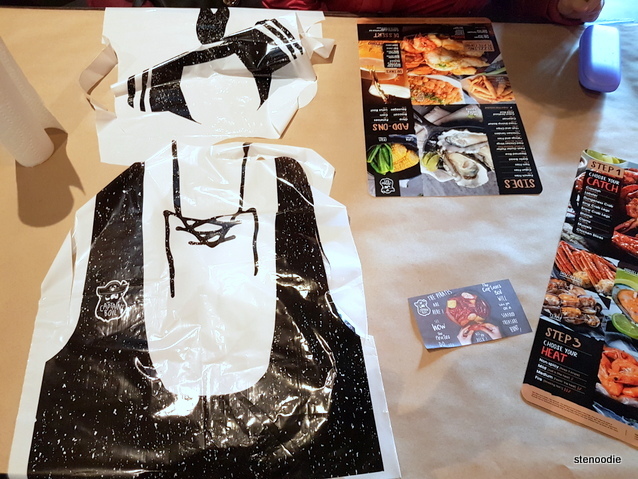 We arrived to the restaurant just before noon and there was one other table of patrons dining in as we got seated. Our server was very friendly and smiley during our whole visit (there was also another server that seemed to be a trainee). The female server asked if we had been here before and then served us some hot water with lemon before we placed our orders. Due to my cravings and wanting to share with my mom the deliciousness of what captain’s Boil was all about (it was her first visit to this seafood boil franchise chain), we ordered two pounds of the King Crab Legs in Medium Heat in Captain’s Boil sauce and then also the Sizzling Plate Combo (chicken teriyaki and assorted seafood with rice) which came with 2 clams, 2 shrimps, 2 mussels, and 2 crawfish! This was also in the Captain’s Boil sauce and Medium spice. 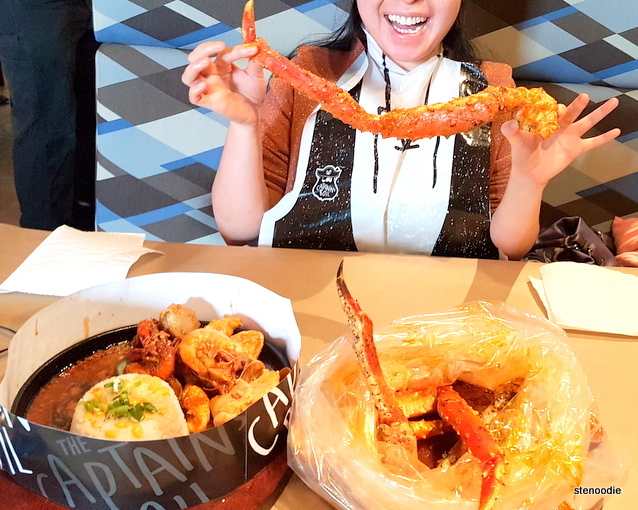 It took about 10 minutes for the King Crab Legs to be served and what a feast it was! 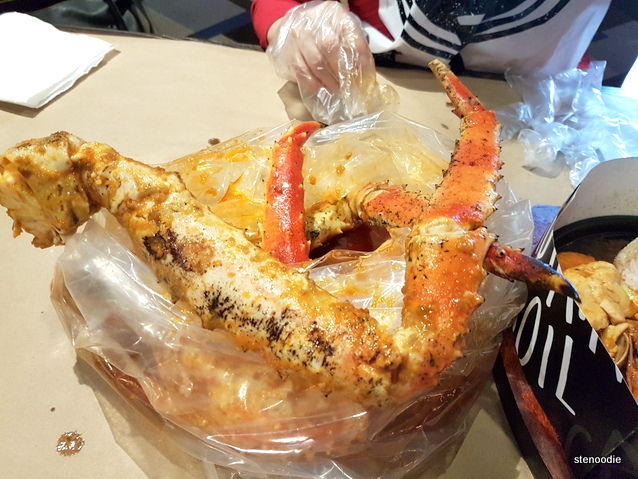 Two pounds of the monster king crab legs turned out to contain about 4 large legs including a claw. 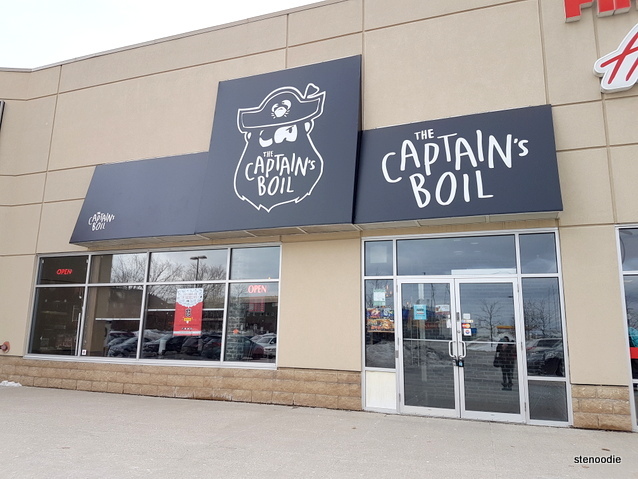 The Captain’s Boil sauce was just as delicious as it was on Wednesday night and I was so thoroughly satisfied with the large meaty legs as well as the sauce. It was perfectly garicy and slightly spicy for me. My mom really enjoyed it too and totally understood why I wanted to return again so quickly to eat these. 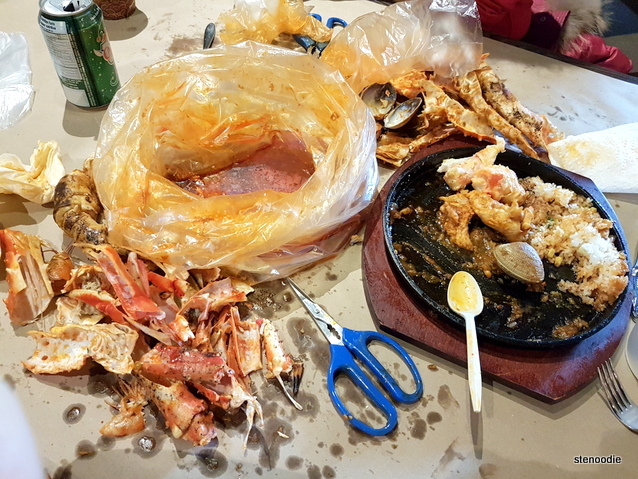 ^_^ We had such a great time eating through the bag of king crab legs! After each deshelling of the crab legs, I dipped it into the Captain’s Boil sauce before placing it into my mouth. 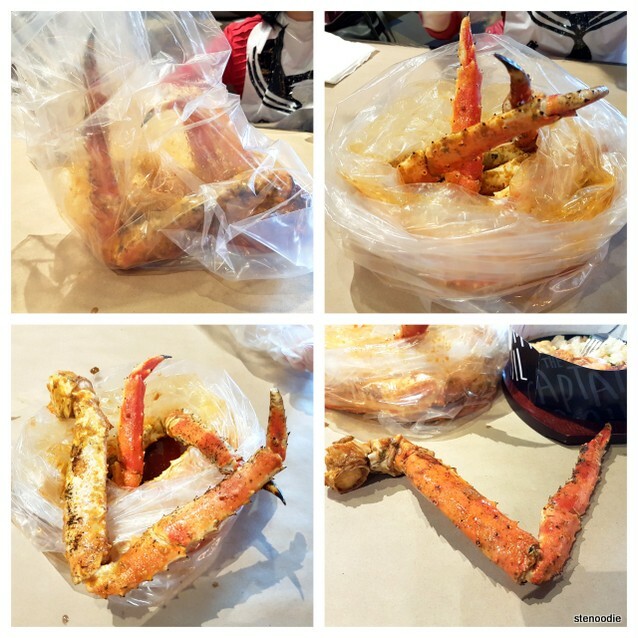 King Crab Legs as they arrived on the table in a bag and gradually taken out to eat. They were huge! 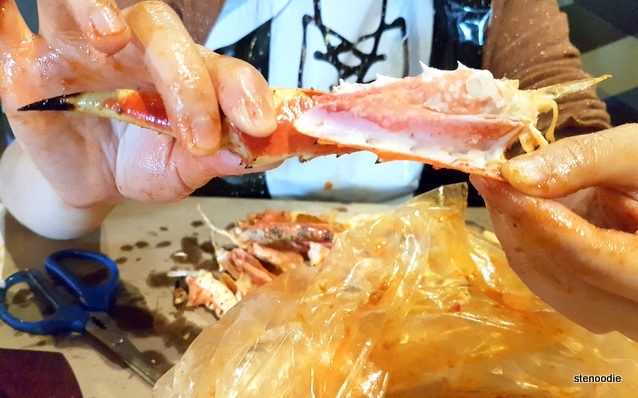 I was so impressed that even the meat of the crab legs grew into the shell of the crab; this was a huge crab! Thanks for delicious the sacrifice! 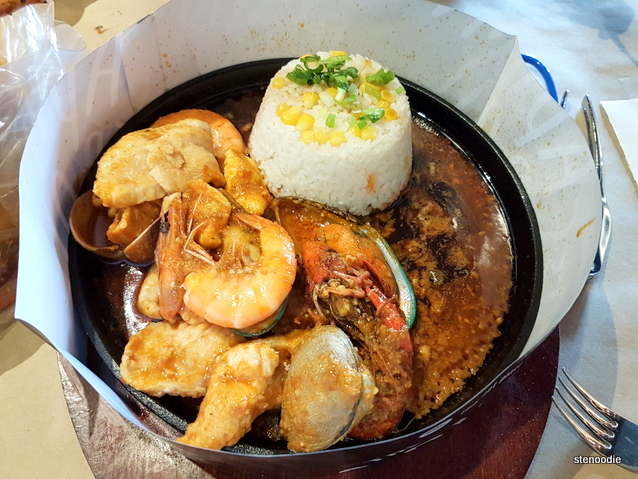 The Sizzling Plate Combo contained chicken and the assorted seafood items that I had described above. This was such a great deal for $10.95. 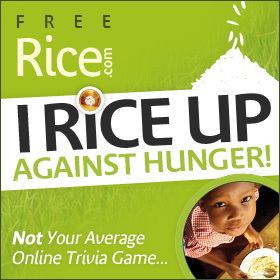 One person can easily get full on this for lunch. 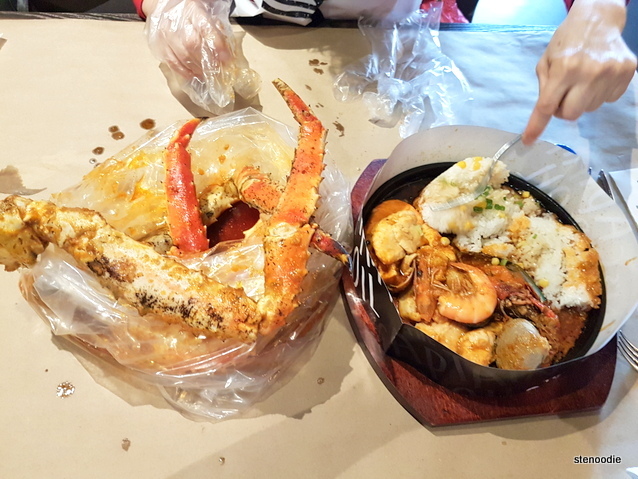 The seafood was fresh and the rice mixed with the Captain’s Boil sauce was again very yummy! We actually had one of the clams still closed so I informed the server at which point the manager came over to inspect it. Shortly, the server returned with a clam that was fully cooked and open. Yay! We couldn’t finish all of the rice so we packed it home and included some of the extra leftover sauce from the king crab legs so that we could stir fry some rice at home to enjoy a bonus Captain’s Boil meal at home (haha). Again, it was a great repeat visit to the Captain’s Boil. 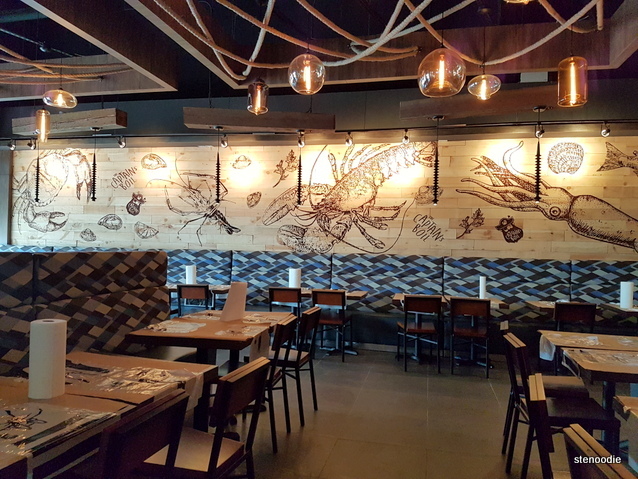 I really have to recommend the Sizzling Plate Combo if you visit their restaurant (but it is only available before 4 p.m.) and the King Crab Legs. These two items are off the charts! Everything else is quite delicious too, but these are definitely my top two picks. 🙂 Thanks for reading! 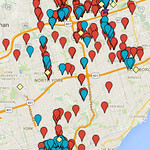 Newmarket is their 10th store opening! This entry was posted in Food and tagged 16640 Yonge St Unit 3, @thecaptainsboil, @thecaptainsboil twitter, Captain's Boil sauce, eating seafood in plastic bags, food blog, foodie, king crab legs, King Crab Legs in Medium Spice in Captain's Boil sauce, lunch at Captain's Boil, Newmarket, restaurant review, seafood lunch restaurants in Newmarket Toronto, seafood restaurants in Newmarket, Sizzling Plate Combo, The Captain's Boil, The Captain's Boil lunch, The Captain's Boil Newmarket. Bookmark the permalink. OMG THE KING CRAB LEGS ARE HUGE!! !